Salesforce allows us to upload various types of Documents. You can upload these documents as an Attachment or in the Document’s section. Salesforce offers File storage for each edition. It includes files in attachments, Document’s tab, File’s tab, File field, Salesforce CRM Content, Chatter (including user photos), and Site.com assets. For security reasons, you may configure the way some file types (like HTML) are handled during upload and download for your organization. Before Sprig’14 release Salesforce provides one feature to handle HTML document, called as “HTML Documents and Attachments Settings“. 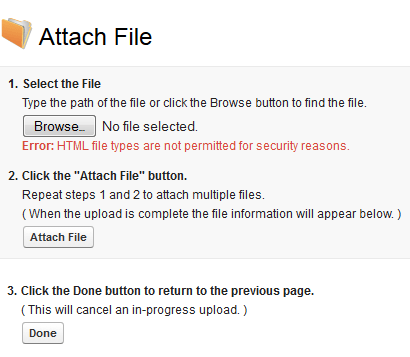 After enabling this feature, it doesn’t allow users to upload HTML files to the Document object or as an attachment. If you enable this feature users cannot upload following file extensions as a Document or an attachment; htm, html, htt, mhtm, mhtml, shtm, shtml, svg. After Spring’14 old feature “HTML Documents and Attachments Settings” is going to be replaced by new feature “File Upload and Download Security“. 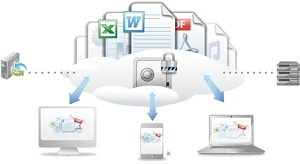 This feature provides you a way to control file upload and download settings. This feature is available in Developer, Performance, Enterprise, Professional, Contact Manager, Group , Unlimited editions except Database.com. This security setting, if enabled, blocks users from uploading files with these extensions: .html, .htt, .mht, .svg, and .thtml. This setting does not affect attachments on email templates; HTML attachments on email templates are always permitted. Downloaded (recommended) :- The file is always downloaded. Execute in browser:- The file is displayed and executed automatically when accessed in a browser or through an HTTP request. 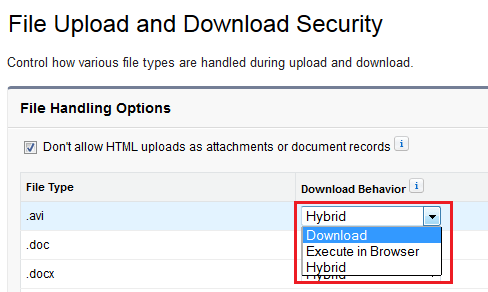 Hybrid:- Attachments and document records execute in the browser. Salesforce CRM Content files and Chatter files are downloaded.